Multani Mal Modi College has won the Inter-Zonal Cricket Championship (Men) held at Govt. Rajindra College, Bathinda. 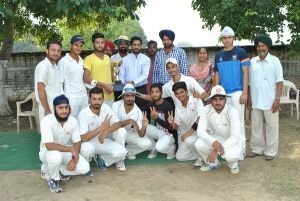 The winning team comprised of Arun Bharti (Captain), Anmolpreet Singh Rai, Mandeep Inder Bawa, Karan Pathak, Sagar Kumar, Plash Khurana, Manpreet Singh, Shivam Ghai, Kartar Singh, Karan Kaila, Sanveer Singh, Jashanjot Singh Bhangu, Ikjot Singh Thind, Anmol Malhotra, Namanpreet Singh and Harinder Harry. The college Principal, Dr. Khushvinder Kumar and Dr. Gurdeep Singh, Chairman, Sports Committee of the College, congratulated the winning teams. The Principal also applauded the sincere efforts of the teachers-in-charge of sports activities, Prof. Nishan Singh and Ms. Mandeep Kaur. The Principal said that these sportspersons will be duly rewarded during the Annual Prize Distribution Function of the College.